Don't bother looking too hard--it's right there in front of your nose. ;) Three Lynx Falls stands like an oasis of unsullied beauty in an area marked at intervals with unsightly patches of logged forest. 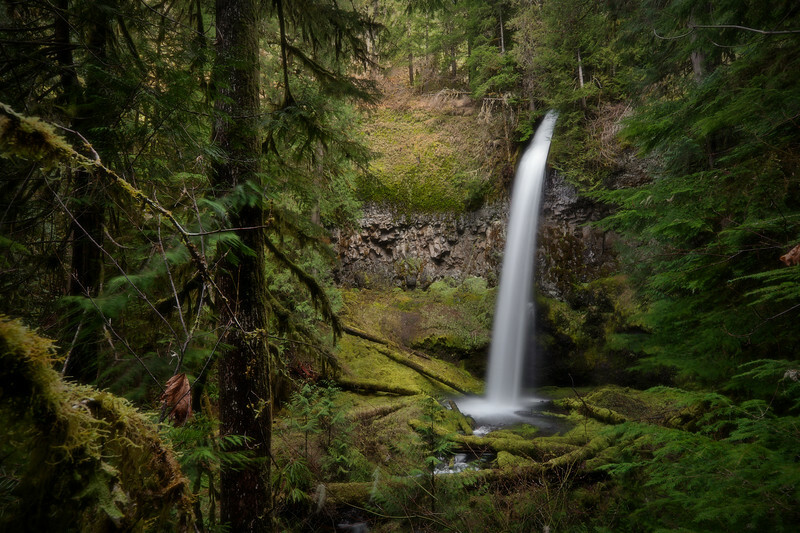 A stretch of unpaved road takes you up from the town of Three Lynx's little school to the modest little dam below the plunge pool, through a lush, mossy forest uninitiated to the blight of the chainsaw. And as the main water supply of the tiny community of Three Lynx just downstream, the principle to always leave no trace takes on an even greater imperative. I would love to visit here again, but I won't do it if the folks that inhabit the charming hamlet ever object. Hopefully that never happens, but human nature being what it is, all it takes is one unfortunate experience with a less than responsible hiker to ruin it for everybody. Always tread lightly and respectfully!